You have the shop running on Shopify, but you see that you are not getting enough customers as you planned? You did install all kinds of different application that promised you a better SEO and Google rank, but you still do not see any improvement? Your mobile version of the store is slow and you don’t know how to fix that? There is one Shopify application that definitely helps you out. AmpifyMe is doing a couple of things, but the main goal is to generate blazing fast AMP pages for all your store products, collections, blogs, and pages. If you want to know more about AMP technology you can read here, but in short, AMP pages provide a new way of how mobile web is working. No more slow and unresponsive websites. No more waiting, you get instant page load, instant information. What do AMP pages have to do with SEO? It’s like this. Google really loves AMP pages, because, guess what, AMP is Google project. 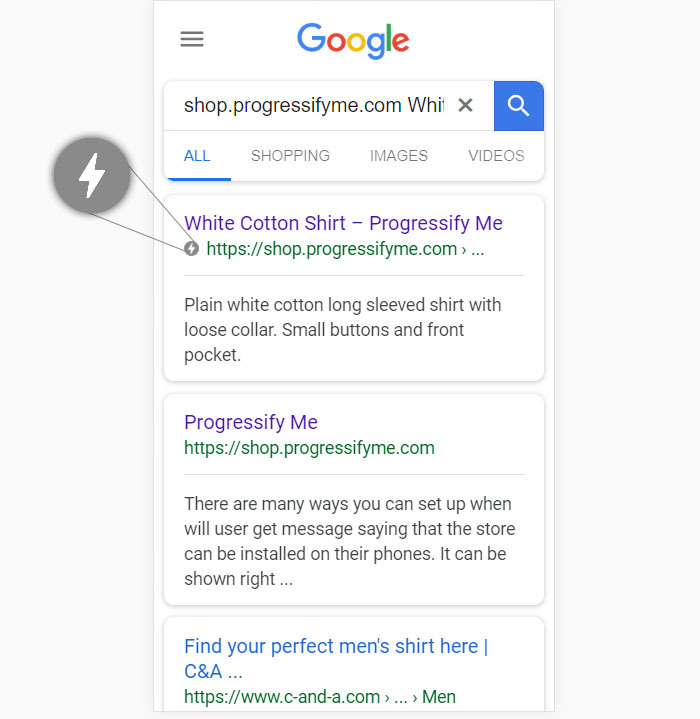 So AMP pages if they are valid, which AmpifyMe is making sure of, will be placed much higher in the search results list hence it will lead to more customers visiting your Store. Google will also mark your store as an AMP ready, which gives you credits and ensures that your Google rank is better. On the picture below you can see how to recognize AMP page. It has a small lightning icon next to it. Make sure that your store is AMP ready by installing AmpifyMe and start enjoying the benefits that come with it.